Preheat the oven to 300°F. Line a baking sheet with parchment paper, or use a non-stick baking sheet, set aside. In a large bowl, add the coconut oil, honey, cinnamon, and salt. Whisk to combine. Add the oats and toss in the mixture until fully coated. Transfer to the baking sheet and spread into an even layer, pressing down gently. Bake for 20 minutes, tossing halfway through. Place sheet tray on a wired rack to cool, the mixture will still be damp. For clumpy granola, press down the top with the back of a wooden spoon or spatula. For looser granola, toss granola before letting to cool. Once mostly cooled, break the granola into clumps by hand. The size of the clumps depends on your preference. Add the strawberries and dark chocolate chips, toss to mix. 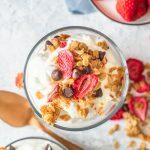 Dark Chocolate Strawberry Homemade Granola Recipe found on https://thissillygirlskitchen.com/homemade-granola/ *All nutritional information is approximate and may not be 100% accurate. Please consult a nutritionist for more specific information.